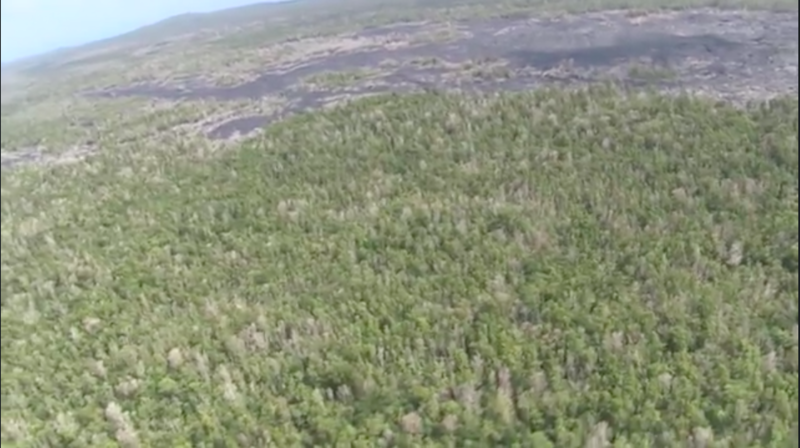 disease has decimated tens of thousands of acres of native ‘ōhi‘a on the Big Island. A virtual army of specialists from a wide array of federal, state, county, and non-profit organizations are engaged in the fight to find a treatment and simultaneously to stop it in its tracks. That’s where education and outreach come in. Their individual signs are different in appearance, but contain the same basic message. Rapid ‘Ōhi‘a Death kills one of the most important native trees quickly and in wide swaths. Failing to follow the simple recommendations outlined on both signs could make you responsible for spreading this disease inter-island and intra-island. Bagshaw is the outreach coordinator at the Ahihi-Kina‘u NAR on Maui’s south shore. The nearest wild ‘ōhi’a is dozens of miles away yet he designed the sign for the Na Ala Hele Trails Access system, because he, like his colleagues, is deeply concerned about the fate of Hawai‘i’s ‘ōhi’a forests. Recently, Bagshaw, his staff, and volunteers conducted awareness surveys with visitors to the Ahihi-Kina‘u NAR. They’ve found very few people have any knowledge about ōhi’a or Rapid ‘Ōhi‘a Death. They’re heartened though, by people’s willingness to adopt the preventative measures outlined on each of the trail signs. Tagawa’s signs will eventually be at every DOFAW trailhead on the Big Island: more than 50 in all. On Maui, Bagshaw’s signs are being placed at all Na Ala Hele trailheads.